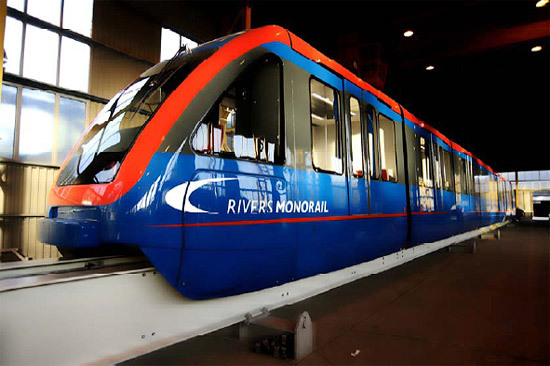 The Rivers Monorail is based on Intamin P30 technology, with trains capable of speeds up to 80 km/hr. The Rivers State government is providing 20% of the costs while TSI Holdings Limited will invest 80%. The first phase of the system will be 2.6 kilometers long. It will have t-supports for future expansion, but open as a single lane shuttle with three stations. Phase Two will double the track and extend the system another 3.9 kilometers. Rivers Monorail is actually somewhat of a hybrid tram/monorail system. The track on straight track is made up of two separate beams. If this were the case for the entire alignment, The Monorail Society definition for monorail would not apply. However, all curved track is enclosed, singular guideway. Rivers Monorail is indeed at least partially 'monorail.' 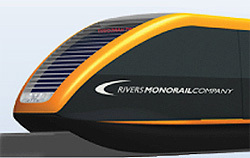 Perhaps a more proper term should be mono-duorail. Before completion, a change in government has placed the completion of the monorail in jeopardy. As of Spring 2016 it was said the system was to be abandoned before opening. See our Construction Gallery for photos.